Summer is here in the Pacific Northwest and oh how glorious it is! I absolutely love this time of year and try to relish every last minute of it. As such, I find myself spending a lot more time outside and out of my kitchen and that mean a lot less baking. However, that doesn’t mean that the mood doesn’t strike me to bake, but it comes a lot less often which is why I haven’t been blogging lately. I like to treat myself to a new cookbook when I’m on vacation and this year's section, as I as on my way to Cannon Beach, was this one: Rustic Fruit Desserts by Cory Schreiber and Julie Richardson. I bought this book totally on impulse as I waited to checkout. On a side note: I stopped in Portland specifically so that I could go to Powell’s bookstore. This store is AMAZING! You literally get a map when you walk in the door because the place is so big! It takes up an entire city block! It’s completely independent too and so that makes it extra fun giving them my business. I spent several hours in the store, most of which was in the cooking and baking section alone but I couldn’t have spent several more hours there. I am already longing to go back again but I digress! I read this cookbook like a novel while I sitting on the beach along the Oregon Coast. The day after I arrived home I decided to make this specific recipe because it just looked so darn good and let me tell you, it’s fan-freaking-tastic! Maybe it's the amazing cherry season that we're having or that I was still on my post-vaca high, but let me tell you that this cookbook is one of the best that I’ve seen in a long time. Each recipe is well thought out and each written in a way that’s easily understood. The photos are beautiful too. When making this particular cake, I was out of a few things and had to substitute some of the ingredients and it still came out great. I loved it so much that I decided that I needed to give away a copy to one lucky reader* and, just because I think it’s would complete the experience, it will be shipped via Powell’s books too! One of my favorite things about this cookbook is the fact that each recipe includes the weight of the dry ingredients as well as the standard measurements. As anyone who has read my blog knows, I am a firm believer in the use of a kitchen scale. It makes measuring ingredients a breeze, creates a lot less mess because you don’t have to wash a bunch of measuring cups, and makes making recipes so much more consistent. It’s really the only way to go! I actually have a chart taped to the inside of my kitchen cabinet which lists the weight of all the ingredients that I use the more often to help speed up my preparation. Now as luck would have it, my new best friend William, of EatSmart Products sent me their new Eat Smart Precision Pro Kitchen Scale to evaluate. The timing could not have been better because my old kitchen scale was well past its prime and I was considering buying a new one. I was impressed with the scale the moment I received it. It’s very lightweight, compact, and very modern looking. When I took it out of the box, the first thing I couldn’t help but notice is that it has a big, bold display that is set away from the main weighing area. This makes it really easy to read the weight of whatever you might be weighing without having to worry if the bowl or plate that you’re placing on top of the scale is covering the scale’s read-out. It also measures in grams, ounces, kilograms, and pounds! And hold on to your hats folks, they actually ship this little gem WITH the batteries! But that is not the best part about this scale – nope, the best part is that I get to give away one to one of my very lucky readers*! Lucky you, huh? * To enter for your chance to win either the scale or the cookbook, you must follow leave me a comment below (no email please), and provide a link to your blog or some means of reaching you. If you don’t provide a way for me to contact you, you can’t win! Contest is only open to those that live in the United States (my apologies to my foreign readers!) All entries must be received by Thursday, July 30th. A winner will be selected at random and announced on Friday, July 31st. All entries will automatically be entered to win both the scale or the cookbook. 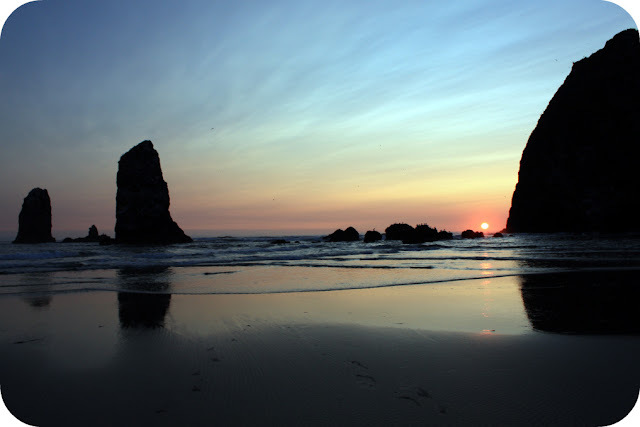 This is a picture of Cannon Beach at sunset which is where I spent the majority of my vacation. Oh and a word of caution to everyone who makes this recipe: Try not to eat all the batter because it tastes REALLY YUMMY! Seriously I could have very easily sat on my couch and eaten the entire bowl with a spoon while watching Steel Magnolias. 1 tablespoon of unsalted butter at room temperature for the pan. To make the caramel topping, slowly melt the butter in a saucepan over medium heat until it's all melted. 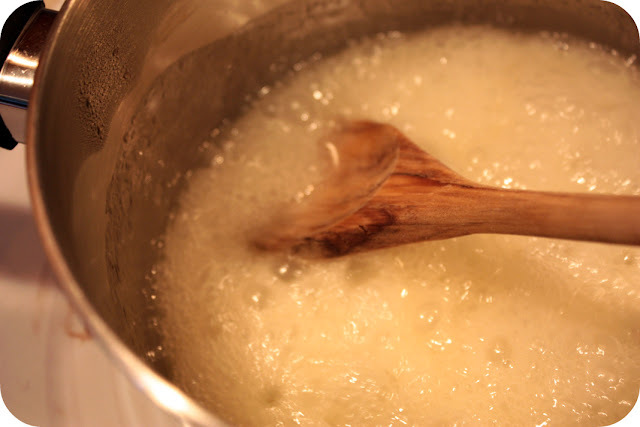 Stir in the sugar and lemon juice with a wooden spoon. Turn the heat up to medium-high heat and bring the mixture to a boil. As it boils it will become foamy and change color from beige to amber brown. Once it just starts amber, pour the caramel into the prepared pan. Set aside to cool for about 10 minutes. Place the pitted cherries in a single layer on top of the caramel with the pitted sides facing up. Set aside. Sift the cake flour, cinnamon, baking powder, baking soda, and salt together in a bowl. Set aside. Cream the butter, sugar, and lemon/orange zest on medium-high for 4 minutes. It will be very light and fluffy. Add the egg yolks one at a time and mixing for a full minute until totally incorporated, scraping down the sides of the bowl after each addition. Add the lemon/orange juice and vanilla. Mix in the flour mixture in three additions alternating with the sour cream in two additions, beginning and ending with the flour (so 1/3 flour, then 1/2 the sour cream, 1/3 flour, the rest of sour cream, and then whatever is left of the flour mixture). The batter will be very thick. Set the batter aside. In a clean bowl, with a whisk attachment, whisk the egg whites on high speed until soft peaks appear. Fold half of the egg whiles into the batter, being sure to incorporate them completely before adding the other half. This means that you don't want to leave any huge blobs of egg white in the batter. It should be an even color throughout. (Not sure how to fold ingredients together? Check out this video from Epicurious to learn more!). 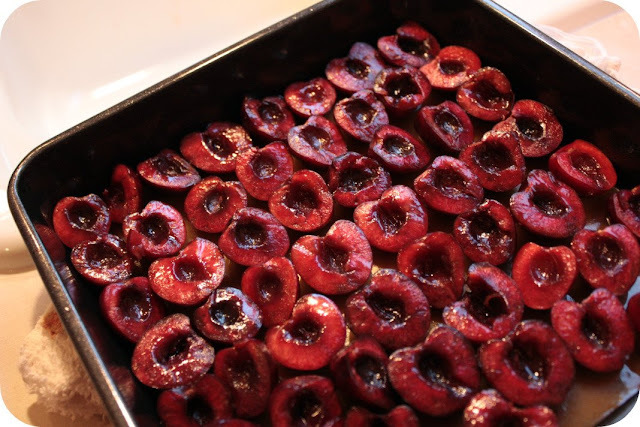 Carefully pour the batter into the pan and gently spread in an even layer over the cherries. Bake for 60 to 65 minutes, or until the top of the cake is firm and the center springs back when lightly touched. Be sure to do use a toothpick to check for doneness too. The cake will be very brown and might crack slightly in the middle; this is normal. Cool the cake on a wire rack for 45 minutes. To flip the cake out of its pan, first run a knife around the edge, then place a flat plate or piece of tin foil face-down over the cake and quickly invert the cake onto the platter in one fell swoop. Cut into squares or wedges and enjoy! Keep covered and store at room temperature. The cake turned out beautifully. I've been reading more and more from home bakers who are finding that weighing their ingredients is the way to go. I've always measured everything out and I'm really intrigued by the idea of weighing them instead. I wasn't paying super close attention and definitely thought the picture with the pitted cherries was of plums and thought this was a huge cake! And I've been thinking of switching over to a scale, but it hasn't happened yet- mostly because I'm moving in a month and want to see how much (or little) space I have in my new kitchen! Glad your vacation was so much fun- the idea of a bookstore a whole city block is amazing! and always from scratch. Lately I have been measuring with a scale but it is not easy to read. Your scale is something special. I visit Powells here in Chicago and spend hours at a time. If I don't win the book I will just have to buy it. You have provided me in you blog with so many great recipes and ideas and for that I am grateful. Your new best friend William? Ha-ha! Is that all it takes? A new scale? LOL. I would have sent you mine which practically new as unlike yourself I don't use it as frequently as I should. I can certainly see why you gobbled up that cake. It looks delish. This cake turned out great! I love cherries and never get to use them quite as much as I would like. 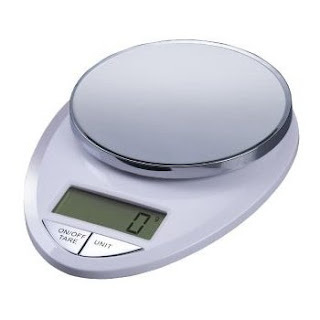 I have never used a scale but have been thinking about getting one and trying it out. I might have to now and see what kind of difference it makes. NOM NOM! That looks delicious! I'd love a new scale, I have my husbands old one and I'm really worried its not quite accurate! I prefer to weigh everything for my cooking anyway, much quicker and easier than fiddling around with scooping stuff, not to mention more reproducible! I love anything cherry and this looks delicious. I'm a real fan of eating batter, although not good for you, so this one probably won't stand a chance. Weighing ingredients is a new concept for me. Wow ~ what a great scale. I've been thinking about purchasing one for awhile. And boy oh boy does that cake look good. I have some cherries in my fridge that I would love to make that with. Yum! this scale would be helpful in OH SO MANY ways! I thought they were plums, too! It looks tasty and might appear this weekend. Scale, yes please! Maybe my scratch baking would improve-for the sake of my friends and family! I just recently got a cherry-pitter so now cherry desserts are a possibility for me. I heard from a farmer that this the best cherry yield in years because of all the sun we have been having. Time to do something with all that gorgeous fruit. Hoo boy, does that ever look good! Your cake looks BEAUTIFUL! Yum! beautiful cake and thanks for the giveaway/s. What a beautiful and delicious looking recipe! Looks perfect for Watching Steel Magnolias (LOVE that movie, my sister and I can quote the whole thing lol). http://livelobrecipes.blogspot.com/ and thanks for posting such a great recipe/give away! That.looks.delicious. And the idea of winning a scale thrills me. I am not a big cherry person and this made me drool. I will have to try it out sometime soon. Have you given this scale away? I am in desperate need of one!! Pick me please oh please!! I love your blog! How did you know I have some cherries sitting in my fridge and I was wondering what to bake with them? I would love the kitchen scale as my husband is from UK and they weigh everything. Many of his cookbooks use weights only and believe it or not we don't have a kitchen scale yet! I can't WAIT to try this cake. It looks and sounds amazing. Thank you for the recipe and the chance to win the book and scale - either one would be wonderful! I just came across your blog, and it couldn't be worse timing because I just started a diet, lol! I don't see why I couldn't have a cheat day once in awhile...I could definitely use a kitchen scale, as I am supposed to be weighing out all my portions. I would love a new cookbook equally as well! Thanks for the giveaway, and I'm looking forward to following your blog! Wow, it looks beautiful! I've always wanted a food scale so that I can cook with scientific precision. Alton Brown would be so proud if I won!!! This cake looks absolutely delicious! Along with all of the other fabulous recipes- I definitely want to try this one!! The cake sounds heavenly. I'm going to try that with some fresh cherries that I froze last week. I have two pounds of cherries in my fridge that were obviously placed there for this very recipe! Thanks. Perfect cherries are selling for $1.99/lb here in Texas; I simply had to bring them home. Ah, Steel Magnolias- my favorite! This cake looks scrumptious and your cherries are so dark and beautiful. I wouldn't even mind having cherry stained hands just to have a slice. I've been thinking about getting a kitchen scale recently. SO even if I don't win, I might look into this one. Thanks for the opportunity! You always amaze me by making me love stuff I would normally never eat on my own. This cake was really good, very sweet and moist! Thanks for bringing it in! This looks so delicious. I would so love to win!! Thanks for the chance. this looks delicious!and powells is easily the best bookstore in the US. I'm a firm believer in the scale too. I wish more cookbook authors used weight measurements. And I too have a sheet taped to the inside of my cupboard with weight conversions! I can't wait to make this cake. I have just gotten into using my scale which is a very archaic cheap scale. Would love to have a new one and....I LOVE cookbooks! I LOVE weighing my ingredients--in fact I always spend time converting recipes from cups to grams if it hasn't been done for me! Keeping a chart taped inside a kitchen cabinet is a great idea that I will have to copy. Powell's is one of my favorite things about living in Portland! I am allergic to raw stone fruit so I am always looking for ways to be able to eat cherries, peaches, etc. This is definitely going on my list. I really would love that kitchen scale! What a hard choice! An awesome scale or yummy recipes. I bake often but not at a professional level. Thanks for the chance! I'd love a kitchen scale! I love cookbooks and baking, I can't imagine a book store that big, I would have had to spend the night! I would love a kitchen scale. I do a lot of cake baking for friends, family and a few clients, so it would really come in handy! Love your blog, go to it everyday to see what you have baked lately! Absolutely cannot wait to make this cake! I love cherries and it's a great excuse to buy an extra bag this week!! I love the idea of treating yourself to a new cookbook every vacation! Not that I need another excuse for a new cookbook, of course. Don't have a blog yet!!! I would love to win that cookbook! YUM! Yay for a fun giveaway! 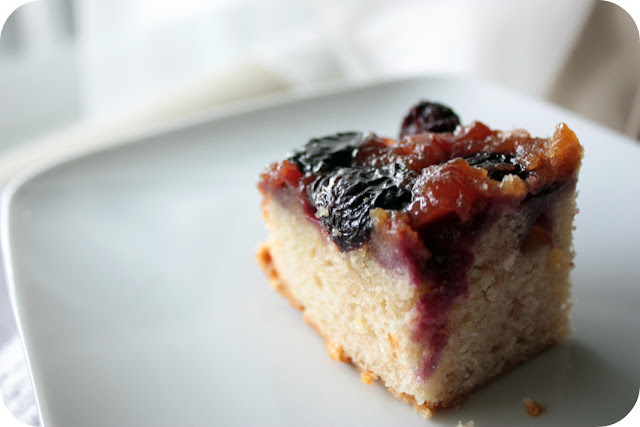 Your cherry cake looks so good and very addicting - yum! Bearing your caution in mind, i would like to give it a try, but can't find the baking powder in the cake ingredients list. Would you mind posting it? I have made two different cherry upside down cakes already this summer, and they have both been fine, not great. Third time's a charm, right? Maybe this will be the one to set my socks on fire! The recipe looks great and I would love either of the prizes! Yum Yum! That looks good. Funny, my scale just quit on me. So a new scale would come in handy right about now. Your recipe looks yummy. I think I'll try to find some decent cherries and treat my co-workers on Monday morning! The scale looks really cool! That's a beautiful cake! I'd love a chance to win eiher the book or the scale. My scale definitely needs an upgrade -- I hate not being able to see the numbers when I'm weighing something! UGH! This scale looks beautiful! Oh my gosh! I was just looking at new scales, and I happened upon your blog! This is an awesome giveaway! I made this cake last night. Delicious! The most time-consuming part was halving and pitting the cherries, which was a challenge with two three-year-olds to take care of! Lemon worked well to remove the cherry stains from my fingers. I used a 9-inch springform round pan, which made flipping the cake a breeze. However, I couldn't fit the pound of cherries on the cake. I used more like 2/3, maybe even half a pound. I also substituted buttermilk for the sour cream, which seemed to work. The cake came out VERY sweet. I'd use less sugar next time. I already have a scale that I'm quite fond of, but that cookbook sounds lovely! :) And I agree: weighing ingredients is so much easier. I wish more recipes listed weight instead of by cups, etc. Recipe is fabulous. I will make this again....and soon! Maybe next time I will weigh the ingredients. But I will have to go get a scale. Thanks for sharing! I always enjoy reading your blog...thinking it might help me come upto speed with baking. Scale ofcourse will be great addition in speeding up. I am oh-so curious about this whole scale thing. I may need to track you down to ask you more. The cherry cake looks delish! The cherry cake looks really yummy! And I'd love that snazzy scale! Your cake looks beautiful and I love cherries, sweet and sour. I am looking forward to trying the recipe. I understand that weighting ingredients is much more accurate and it would be really helpful to have a scale when converting from grams to ounces. And as for cookbooks, I love them and read them like novels. What a way to spend the evening! Love that your treats come flying into my inbox. I found you recently while searching frantically for the Amish Friendship starter - why I was out - who knows? I live in Wisconsin but grew up on the west coast and love your references to my favorites - Miss the coast so much. Used to stop in at Powell's on my lunch hour. That cake looks fantastic! I'd love to see the cookbook. I'd love to have the book! I also thought the cherries were plums. Either way, delicious! Thanks for the giveaway. That cake looks delicious! I like the idea of using a scale with baking. Also, sounds like a great cookbook. Hi I'm Jen, auntie to Emma & Avery. 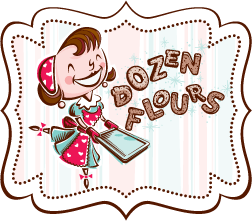 I've been a Dozen Flours blog stalker for quite some time! I have a food scale so if my name is chosen for that one please send it to another lucky reader. I love your blog - your creativity and scrumptions photos are so inspiring! I love cherries and just got a new pitter so this is perfect timing. The cake looks delicious. I never thought much of weighing until I started reading foreign food blogs. Tried making a cake transcribing the weights to cups. The cake came out ok but I think it would have been better if I weighed it. May have a new convert. Have to say that when i tried this everyone loved it! I am a stress baker so when work gets crazy there is suddenly an abundance of baked goods in our office and everyone loved this one. Thanks for posting and I have been to Powells when i was at a conference in Portland and loved it, Living in NY I am a little spoiled with being so close to Strand bookstore. Thanks for the wonderful recipe! I love cherries!! The cake looks delicious!! A scale would be the perfect item in our house. 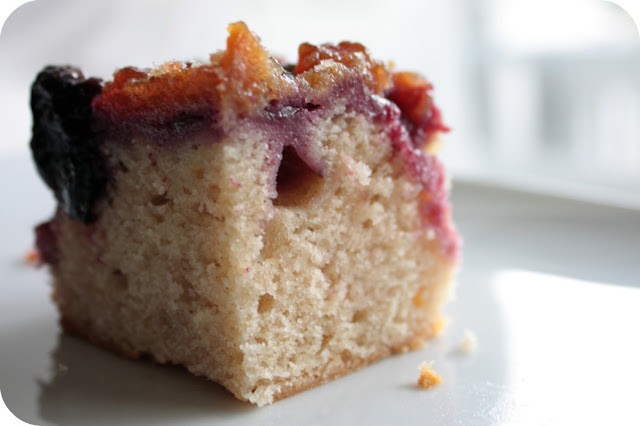 Love your sweet cherry cake. I just bought some cherries too! i know with one of those scales, it will make my life that much easier. thanks for the givaway! I've never used a scale to bake with...hmmm...am up for learning a new skill. And the cookbook sounds amazing...if this recipe is any indication! I really like this scale, and I really need one. Your blog rocks. I can't wait to try this recipe. I see one reader used a springform -- I'll try this with one of mine. I'm also intrigued by the weighing vs. measuring. Now I need to look on your site to see about blueberry recipes, as I've got a freezer full of blueberries I put up about a month ago. Take care! can't wait to try this...looks sooo yummy yummy yummy! kbabes204@yahoo.com THANKS!! That looks incredible. It's making me salivate at my desk right now. That looks fantastic. I just saw an upside-down plum cake on TV last night. I am taking these two incidents as a sign I must make upside-down something. I love cherries in desserts--your recipe looks like a winner. I have been considering weighing my ingredients--it really makes more sense than our American form of measurement. STANARDSVILLEGAL- Planning to make this cake tomorrow. So glad to find this recipe for sweet cheeries. Will be taking it to a family reunion on Sat., aug. 1st. Sure to be a big hit! Need a scale. On limited income would love to win. I would love a scale or a cookbook! Always looking for new things to try! Thank you to everyone who played a long with this giveaway! The contest is now over. There will be more though so keep checking back! Im a newly wed but vintage bride, (alternative words for old are great arent they?) whose husband loves me only slightly more than fresh cherries. But Im going to take my chances and make this anyway! It looks like an obsession we could both share!